The Trump administration threatened new sanctions on North Korea after the reclusive government shattered 2½ months of relative quiet with its most powerful weapon test yet. Russia’s U.N. ambassador Vassily Nebenzia also urged North Korea to stop the tests and called on the U.S. and South Korea to cancel large-scale military maneuvers scheduled for December. 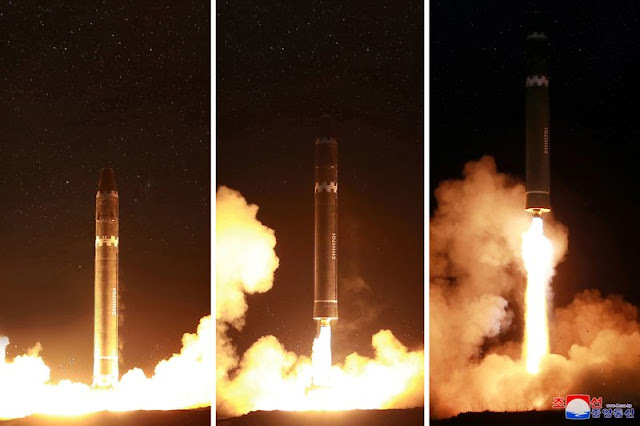 In a government statement released through state media, North Korea said the Hwasong-15, the “greatest ICBM,” could be armed with a “super-large heavy nuclear warhead” and is capable of striking the “whole mainland” of the U.S. The North said the missile reached a height of 4,475 kilometers (2,780 miles) and traveled 950 kilometers (590 miles) before accurately hitting a sea target, similar to the flight data announced by South Korea’s military. If flown on a standard trajectory, instead of the lofted angle of the test flight, the missile would have a range of more than 13,000 kilometers (8,100 miles), said U.S. scientist David Wright, a physicist who closely tracks North Korea’s missile and nuclear programs. “Such a missile would have more than enough range to reach Washington, D.C., and in fact any part of the continental United States,” Wright wrote in a blog post for the Union for Concerned Scientists. 0 Response to "Haley: NKorea ‘brings us closer to war’ the US doesn’t seek"